Watch Hill Lighthouse sits atop a bluff on the north side of the eastern entrance to Fishers Island Sound. According to local legend, Watch Hill received its name during King George’s War (1744 – 1748), when a watchtower and light were established on what was then known as Bear Hill. The purpose of the light was not to serve ships in the Sound but rather to warn local residents of a naval attack. The watchtower continued to be used in the 1750s during the French and Indian Wars to track French pirates that were molesting local fishermen and merchant ships. When a pirate ship was spotted, a signal was sent out to local mariners – a smoke signal during the day, and a large bonfire at night. This tower was destroyed during a storm in 1781. 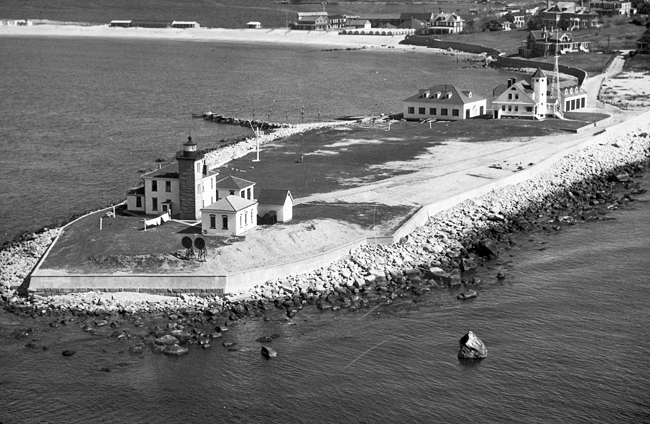 Many mariners petitioned for a replacement for the lost tower, although some felt that putting a lighthouse on Little Gull Island was more critical. Some kind of navigational warning was obviously needed, as demonstrated by the number of recorded shipwrecks on the dangerous reefs around Watch Hill. 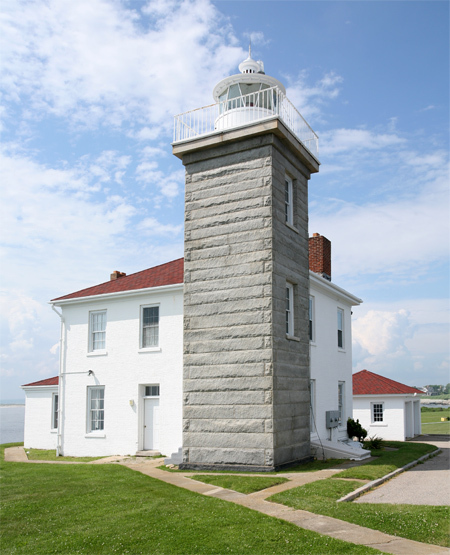 By the early 1790s, Congress was discussing the necessity of a permanent lighthouse on Watch Hill, but it was’t until 1806 that Congress appropriated funds for the lighthouse and President Thomas Jefferson signed the order authorizing the project. The government surveyed local maritime interests to determine the requirements of the new light. The findings indicated that a first-class light was unnecessary as no transatlantic ship traffic passed Watch Hill, but a small light would benefit local and coastal traffic. As the light neared completion, Secretary of the Treasury Albert Gallatin wrote a letter to the superintendent of lights for Rhode Island and asked that Jonathan Nash of Westerly, Rhode Island, be notified of his appointment as keeper of the new light at an annual salary of $200. Keeper Nash served at Watch Hill Lighthouse for twenty-seven years and recorded forty-five shipwrecks during that time. Four acres of land for the lighthouse were purchased for $500 from George and Thankful Foster, and in 1808, the thirty-five-foot-tall, wood-framed tower, Rhode Island’s second lighthouse, went into operation. 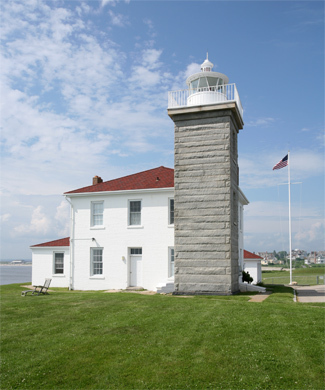 The lighthouse and a five-room frame house for the accommodation of the keeper were built by Abisha Woodward, who was also responsible for lighthouses in Connecticut at New London, Faulkner’s Island, and Lynde Point. In 1838, the lighting apparatus in the lantern room consisted of ten sets of lamps and reflectors arranged on iron frames in two equal clusters. The lamps rotated by means of a large weight suspended in the tower. As the weight dropped, it energized a clockwork mechanism, which caused the iron frames holding the lamps to revolve once every two minutes and forty-two seconds. This was a fairly standard apparatus for the time, but had to be carefully watched for if the light stopped revolving, mariners might mistake it for the fixed light at Stonington Lighthouse, only two-and-a-half miles to the northwest. Edmund Blunt of the coast survey service visited Watch Hill Lighthouse in 1837 and noted: “The light at Watch Hill is a very bad one; the lamps are bad, the reflectors too small and of bad figures, and some of them cannot be adjusted. It is a singular instance of ignorance, that before each light there is placed a thick piece of glass, the usual ship-deck light for a lens. The effect of this is in a great measure to destroy the effect of the lamps.” Blunt had the lenses temporarily removed, and the result was astonishing. Colonel Brown, the collector of the port, was present and remarked that the light was so much more brilliant “that they would not know what to make of it at Stonington.” Blunt believed the lenses had been patented and supplied by Winslow Lewis, and concluded his report, writing “It would be well worth the inquiry to ascertain the whole cost to the public of this ingenious patent to obscure lights.” The lenses were soon permanently removed from the lighting apparatus at Watch Hill. By the 1850s, the wood in both the tower and the keeper’s dwelling was rotten, and the structures were falling apart. The sea had also eaten away at the surrounding land until the tower was dangerously close to falling over. As neither structure was deemed worth the cost of repairs, $8,300 was obtained in 1854 for constructing a new lighthouse and keeper’s dwelling. 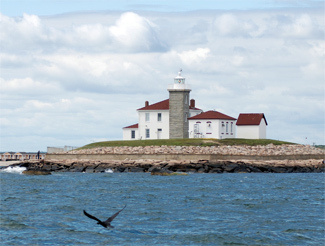 The present Watch Hill Lighthouse, located about fifty feet northwest of the first lighthouse, was completed in 1856 as part of a building frenzy that started after the Lighthouse Board took charge of all navigational aids in the United States. Built of ten-inch-thick granite blocks with a brick lined interior, the ten-foot-square tower stands forty-five feet tall and is attached to the southeast corner of the two-story, brick keeper’s dwelling. As built, the residence had three bedrooms, a sitting room, dining room, kitchen, maintenance room, and a cellar. The increased height of the new tower, coupled with the fact that it was built on higher ground than its predecessor, meant that the light from Watch Hill could now be seen from a much farther distance. The new tower was placed in operation on February 1, 1856 and exhibited a fixed white light from a fourth-order Fresnel lens. By the early twentieth century, mariners were becoming confused by the competition from bright street lights and other signs of electrified civilization, so the lens was replaced around 1916 with a revolving optic displaying a white light for ten seconds followed by five seconds of darkness punctuated by two red flashes. After the new lighthouse was completed, the surrounding seawall was deemed inadequate at preventing further erosion of the site. Construction of a new seawall that extended below low water and was protected by enrockment at its base was recommended, and $10,000 for this project was appropriated in 1856. Captain Jared Crandall was placed in charge of Watch Hill Lighthouse in 1868 and served for just over a decade until his death in 1879 at the age of fifty-seven. Keeper Crandall and his wife Sally had seven children, who spent a good portion of their childhood at the lighthouse. After her husband’s death, Sally Crandall assumed responsibility for the light. Sally was reportedly the most popular lighthouse keeper on the coast, and when the election of Grover Cleveland as President in 1884 made Democrats the ruling party, mariners from New London to Newport signed a petition demanding that she not lose her job. Fanny Schuyler, the station’s only other female lighthouse keeper, replaced Sally Crandall in 1888, but Fanny’s term as service was a relatively short two years. A fog signal building was added to the station in 1909 and equipped with a third-class Daboll trumpet. An assistant keeper was assigned to the station at this time to help with the extra workload created by the fog signal, and the head keeper was forced to surrender the second story of the dwelling to the assistant. 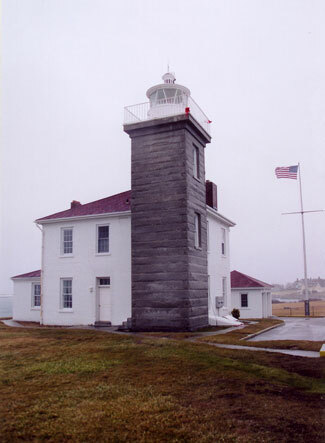 The presence of the improved Watch Hill Lighthouse still couldn’t prevent all maritime disasters in the area, especially in times of fog. On June 28, 1918, the freighter Onondaga ran aground on Watch Hill Reef in heavy fog, and sank in fifty feet of water. Two months later, the fishing steamer George Hudson, loaded with one thousand barrels of menhaden, hit a nearby reef in thick fog and sank. Fortunately, in both instances, all members of the crew were able to escape in lifeboats before the vessels went down. Watch Hill Lighthouse could not have prevented the two worst maritime disasters to occur in the area. On the night of August 30, 1872, the schooner Nettie Cushing collided with the much larger passenger steamer Metis. The bow of the Nettie Cushing cut deep into the Metis, inflicting a fatal wound. Eighty-five people were rescued from the sinking vessel by boats that rushed to the scene, but sixty-seven souls perished in the storm-tossed seas. Keeper Jared Crandall and nine other men, who “so gallantly volunteered to man the life-boat and a fishing-boat and saved the lives of thirty-two persons from the wreck of the steamer Metis,” were awarded Congressional Gold Medals. Daniel Larkin, keeper of the lighthouse before Crandall, was one of the other men that was honored. We left Providence at 7 o’clock. A brisk northwest wind was blowing, and we were off Watch Hill at about 11 o’clock. I had gone below to look over the passengers and freight, leaving a good pilot and quartermaster in the pilot house. I returned to the pilot house, passing through there on my way to my room. Everything was O.K. in the pilot house as I stepped into my room and prepared to retire for the night. Suddenly I heard the pilot blowing danger, and I hurried into the pilot house. There was a schooner on the port and her crew seemed to have lost control of her. Without warning she luffed up and before we had an opportunity to do a thing headed for us. The quartermaster and pilot put the wheel hard aport, but the schooner was sailing along under a heavy breeze, and in a moment she had crashed into our port side, directly opposite the smokestack. The turbulent waters soon disentangled the two vessels, which both began taking on water. The schooner, with its crew manning her pumps, was able to stay afloat until it reached a point a few miles west of Watch Hill, where the crew abandoned ship and rowed ashore in a lifeboat. Those aboard the steamer were not as fortunate. Most passengers had retired for the evening, and so those who were able to reach the lifeboats were not properly clothed to face the freezing temperatures. Of the estimated 157 passengers and crew on the steamship, only nineteen survived, and many of these were severely frostbitten and had to have fingers, hands, and even limbs amputated. The Great New England Hurricane of September 21, 1938 caught many people in the Watch Hill area by total surprise. New England hadn’t suffered a head-on hurricane since 1815, and there was virtually no warning of this one. Rising water covered the access road to the station, cutting off any hope of escaping to higher ground, so the keepers and their families had to rely on the sturdy brick walls of the dwelling for protection. At the height of the storm, waves broke over the top of the tower, smashing the windows in the lantern and allowing seawater into the tower. 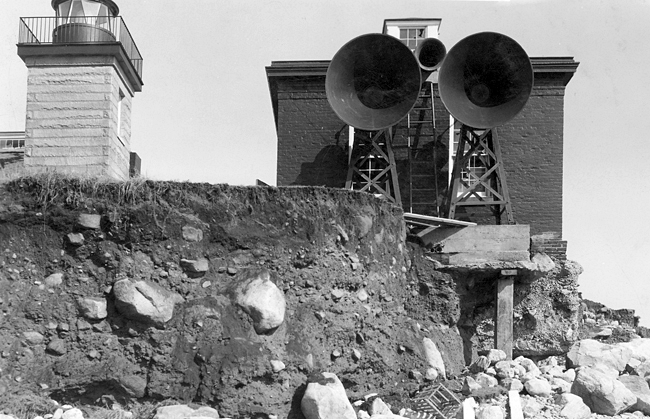 The surrounding sea wall was destroyed, and the foundation of the fog signal building was critically undermined. 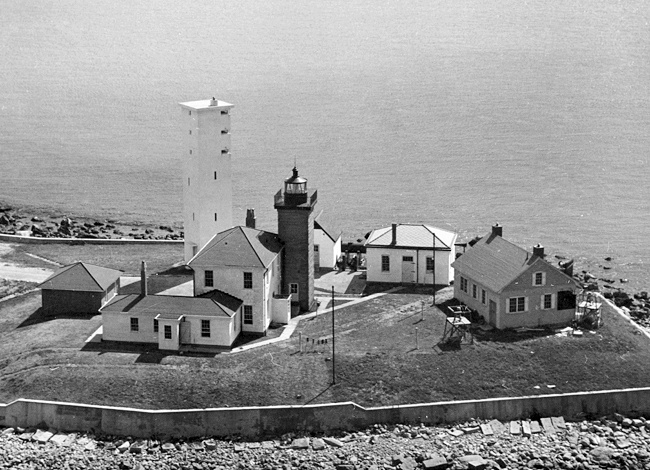 Though there were casualties in nearby Westerly, everyone at the lighthouse survived without injury, and the station was back in operation within a few weeks. Watch Hill Lighthouse was automated in 1986, when its Fresnel lens was replaced by a modern beacon. 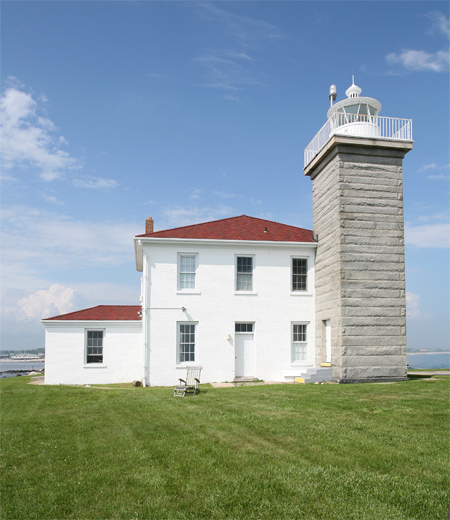 The buildings at the station are now listed in the National Register of Historic Places and are leased to the Watch Hill Lightkeepers Association, which was formed in 1986 to look after the property and has established an endowment for its preservation. 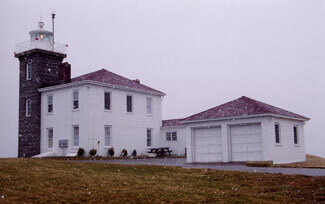 A “Change of The Watch” ceremony was held at the lighthouse on August 31, 1986 to mark the beginning of the association’s thirty-year lease. The station’s revolving fourth-order Fresnel lens along with historical documents and photographs are one display in a small museum that is housed in the oil house and open to the public during the summer. Two apartments in the keeper’s dwelling have been used as rental units, with their tenants helping protect the property from vandalism. Head: Jonathan Nash (1808 – 1834), Enoch W. Vose (1834 – 1841), Gilbert Pendleton (1841 – 1847), Daniel Babcock (1847 – 1849), Ethan Pendleton (1849 – 1853), Nelson Brown (1853 – 1861), Daniel F. Larkin (1861 – 1868), Jared S. Crandall (1868 – 1879), Sally Ann Crandall (1879 – 1888), Fanny K. Schuyler (1888 – 1890), Joseph T. Fowler (1890 – 1895), Julius B. Young (1895 – 1909), Henry Burkhardt (1909 – 1916), James Gregory (1917 – 1919), Willis A. Green (1919 –1922), John F. Anderson (1922 – 1923), Lawrence H. Congdon (1924 – 1943), Ernest A. Sampson (1944 – 1947), Jules A. Serpa (1949 – 1956), William I. Clark (1959 – 1969), John Wilk (1969 – 1974), Jerry Pie (1976 – 1979), William Wilkinson (1979 – ), Charles Merritt (1984 – 1986). Assistant: Arthur W. Blish (1909), Henry Burkhardt (1909), Thomas J. Murphy (1909 –1912), James Gregory (1913 – 1916), George F. Reid (1917), Edrick W. Farnham (1917), Sylvester Kendzia (1918 – 1923), Carl F.W. Anderson (1925 – 1930), Frank Loftin (1931 – 1934), Richard A. Fricke (1934 – 1941), William H. Mack (1953 – 1954), Larry Anderson (at least 1971), Don Coffie (at least 1977), Tony Mehot (1983 – 1986). Capsule Histories of Some Local Islands and Light Houses in the Eastern Part of L.I. Sound, Benjamin Rathbun, 2001. America’s Atlantic Coast Lighthouses, Kenneth Kochel, 1996. Northeast Lights: Lighthouses and Lightships, Rhode Island to Cape May, New Jersey, Robert Bachand, 1989. Located at Watch Hill Point, near the westernmost point in Rhode Island. 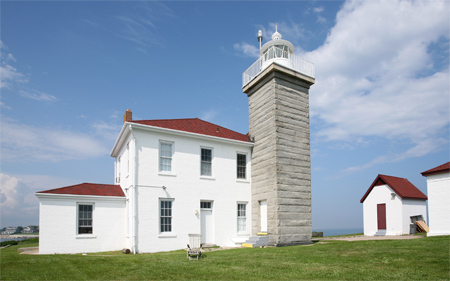 For a larger map of Watch Hill Lighthouse, click the lighthouse in the above map. 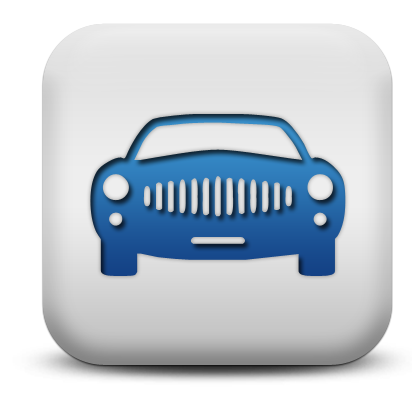 From Westerly, take Route 1-A to Watch Hill, and turn west on Watch Hill Road. After one-and-a-half miles on Watch Hill Road turn left on Westerly Road. From Westerly Road turn left to Bluff Avenue, followed by a right onto Larkin and then a quick left on Lighthouse Road. For some reason, the large parking lot near the lighthouse is limited to handicapped parking so you must park in town and walk to the lighthouse. A museum in the oil house, which features a fourth-order Fresnel lens formerly used in the tower, is open on Tuesdays, Wednesdays, and Thursdays from 1 p.m. to 3 p.m. during July and August. 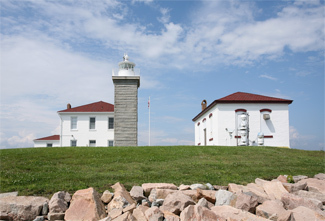 The lighthouse is owned by the Coast Guard and maintained by maintained by Watch Hill Lighthouse Keepers Association. 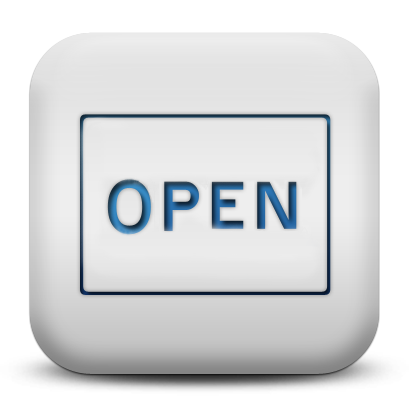 Grounds open, dwelling/tower closed. We first visited this lighthouse on a cold, windy day in January. The ocean was whipped up, which made trying to photograph the lighthouse from the rocky area between the station's fence and the water a risky proposition. Fortunately, the residents arrived during our visit, and kindly let us enter the grounds to snap a picture or two from a less precarious position. If you look closely, you can see the flakes of snow that were falling that day. A January visit to this light is probably not the preferential time as it was amazingly cold and windy. Having said that, this light is in such an incredible location that even freezing sleet is worth it.